Back in the early twentieth century the Solar System was a simple place. Four small planets (three of them possibly inhabited) huddled close to the Sun, girdled by an asteroid belt widely supposed to be an exploded planet. Beyond lay four gas giants with their own moons (also likely inhabited). In and around them orbited various comets. Into this uncomplicated system swept astronomer Percival Lowell, who as early as 1894 believed – from unexplained movements of Uranus – that another world lay beyond Neptune. Planet X. The problem was finding it; but twentieth century technology offered methods unavailable to earlier astronomers. By taking repeated photographs of the night sky and comparing them, manually, with an apparatus known as a ‘blink comparator’, it was possible to find a faint object moving against background stars. 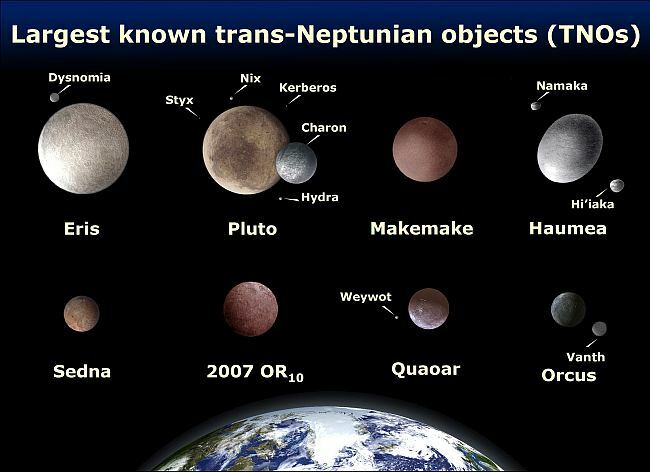 Trans-Neptunian objects to scale. Public domain, NASA, via Wikipedia. The work began under astronomer Vesto Slipher at the Lowell Observatory, in 1929. The math of planetary pertubations gave a general start-point for the search. For those working the blink comparator it was arduous, strain-filled work. But then in 1930, young astronomer Clyde Tombaugh hit the jackpot after many hours staring into the machine. The new planet was an instant sensation. It was the first planet discovered since 1848 – and it leaped into pop-culture almost overnight. Naming rights fell to the Lowell Observatory, and after a slight flurry the name Pluto was suggested by 11-year old English schoolgirl Venetia Birney – after the Greek God of the Underworld. This also commemorated Percival Lowell’s initials. Pluto became a household name – even Walt Disney got in on the act, renaming Goofy’s dog Rover after the new world the following year. 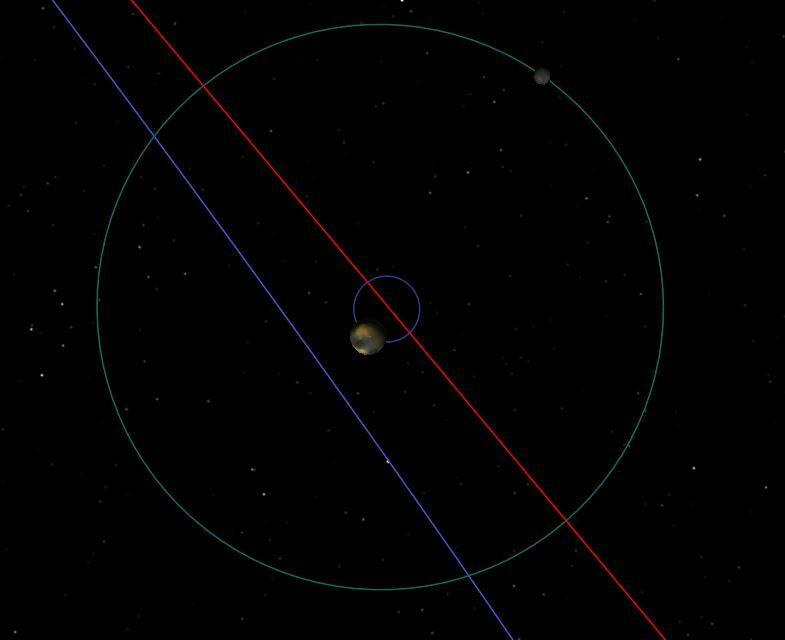 The Pluto-Charon orbit with barycentre as a circle passing through Pluto. I made the diagram with Celestia. Note the distances and sizes: this is to scale. There’s a popular misconception that the Earth-Moon system has these relative scales. It doesn’t. Click to enlarge. Pluto was so distant that virtually nothing could be discovered other than the fact that it was in a strange orbit – one that ran inside the orbit of Neptune, and which was tilted against the plane of the ecliptic. The mystery deepened when Pluto was found to be too small to account for Uranus’ wanderings, a point confirmed in 1978, when Pluto’s mass was nailed down by the discovery of a moon – Charon – orbiting it every six days. They are, in effect, a double planet system, orbiting a common centre of gravity (barycentre). Everything orbits that way, actually – but in the case of Pluto the barycentre is in space. But then the simple picture of the solar system began to unravel. In 1992, David Jewitt and Jane Luu discovered the first of many objects outside the orbit of Neptune; asteroids made not of rock, but of ices. Pluto, it turned out, was part of a spread of icy debris now known as the Kuiper Belt. This unfolded as more instruments were available, finally emerging as a vast and complex cloud orbiting beyond the major planets – apparently left over from the formation of the Solar System. Pluto, it seemed, was one of the objects, orbiting quite close to the inner edge. For a while it seemed Pluto was the largest. But then other objects were discovered, among them Haumea, which is football-shaped and in an eccentric orbit: Sedna – which has an insanely elongated orbit taking it to over 930 times the distance of Earth from the Sun at apehelion: and others such as Makemake, Varuna, Quaoar and Eris. The outer solar system with some of its larger bodies – a diagram I made with my trusty Celestia software. Note how the orbits of the major planets are all in much the same plane, while those of the trans-Neptunian objects in the Kuiper belt are more scattered. All were big enough to be called planets, and some had moons. Suddenly the old ‘nine and maybe ten planet’ model began to unravel. How many planets did the Sun have? Twenty? More? The trigger that got the International Astronomical Union (IAU) into action was Eris. Discovered by Mike Brown of CalTech and originally nicknamed Xena, Eris turned out to be about the same size as Pluto, with a radius of 1163 km, +/- 6. It had a moon, Dysnomia (originally dubbed ‘Gabrielle’). It could have been the tenth planet – but its discovery in 2005 triggered a debate. Suddenly, it seemed, the solar system had a class of icy bodies that didn’t fit prior classification, and this prompted the IAU to come up with a new definition for ‘planet’. One voted into reality by just 237 members in 2006, with a majority of only 80 against the 157 nay-voters, out of a total membership of 10,000. It demoted Pluto to ‘dwarf’ status. The problem to my mind – apart from the fact that 95 percent of IAU members didn’t vote at all – was that the new definition was still prisoner to old prejudices – merely adding a category. Whereas the new discoveries, realistically, should have triggered a deeper re-think. More on that soon. What these new discoveries did make clear was that Pluto was merely one of many similar bodies orbiting beyond Neptune and wasn’t cause of the odd movements of Uranus. In short, the fact that Pluto had been found was a testament to Clyde Tombaugh’s personal dedication and his incredibly hard work. The fact that the IAU then tripped over their definition of planet – both because of the definition itself, and of the fact that it was adopted without the participation of most members – raises another question. How far is our definition of astronomical reality driven by our relentless drive to classify and compartmentalise nature, always framing it with a mind-set that in many ways is still shrugging off the down-side legacies of the Age of Reason? And is there another way we can conceptually organise all the different stuff that’s slinging around the Sun, including us? More in a little while. Meantime, let’s wait on the Pluto encounter and see what New Horizons reveals. I’m excited. Are you? On the topic of Pluto and New Horizons I wrote a post recently on the artefacts carried aboard the spacecraft in case it is ever uncovered by alien civilization in the long distant future, after it has left the solar system. I’m still kinda divided on this one. On the one hand, Pluto has always been a planet in my mind. Nothing significant has changed with it, so why can’t it still be a planet? But on the other hand, it’s not even as large as our moon. So if Pluto is a planet, do we have a twin planetary system with our moon? And if Pluto isn’t as big as other objects in the Oort Cloud, should it really be a planet? I can see both sides of the issue, so I can’t decide which side to join on this one. My gut says keep it as a planet. It’s been one a long time. That’s the thing – ‘planet’, as far as Pluto is concerned, is really a pop-social definition – and we shouldn’t monkey with that. I actually wonder whether the whole ‘planetary’ classification system needs an overhaul. 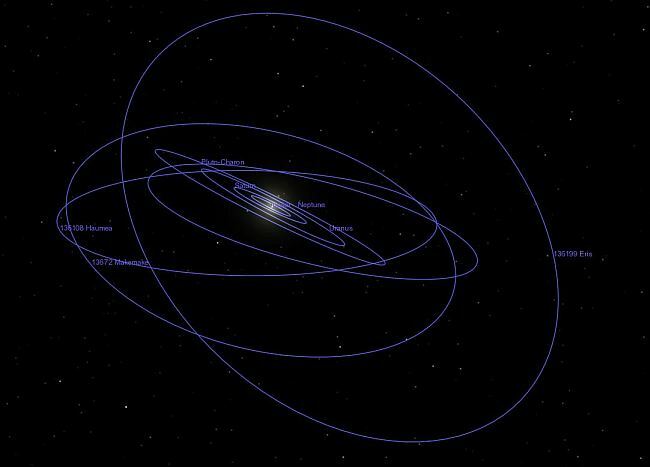 We’ve discovered a lot of new stuff out in our own solar system, quite apart from some bizarre setups in others (including a planetary ring system 1.2 AU across). The old classifications seem to creak a bit, trying to cope. Can you clarify what you mean when you say ‘everything orbits that way…’ I understand what you mean referring to Pluto’s double planet set up, but confused when I think of the Earth orbiting the Sun. Are the two themselves orbiting a barycentre, or is the Sun the barycentre (bending space). I was disappointed when I heard of Pluto being downgraded. Not wanting to resist change for the sake of it, I couldn’t see why the bigger objects couldn’t be classed the same way as Pluto. Nothing wrong with having lots of new planets beyond Neptune, but as you say, new discoveries will challenge old definitions. Barycentre is the technical term for ‘centre of mass of the entire system’, the pivot around which all objects orbiting each other move. Imagine two ballet dancers, holding hands and pivoting around – whoever’s heavier will move less. What it means is that the total mass of the central body and anything orbiting it has to be considered a single system, and the central pivot point calculated knowing the individual masses of the various components, their distances, and their velocity. It’s blatant in Pluto’s case, where it and Charon in effect are a double planet. But that’s rare. Usually it’s academic. Earth and the Sun orbit their mutual barycentre – but because the Sun is 332,946 times more massive than Earth, the barycentre is near the centre of the Sun, below its surface. That’s also true of Earth and Moon (where the Moon is 1/87 times the mass of the Earth). So normally we can say ‘the Earth orbits the Sun’ and ‘the Moon orbits the Earth’, because the central body contains the barycentre. But the technically correct description is ‘both orbit the barycentre’ – and Pluto shows it to us. Yes, that helps, although I wasn’t aware of the term before. I’ve become used to the ‘warped blanket’ analogy; an object orbiting a body because the larger body warps space like a heavy object on a blanket. True! That’s an analogy describing Einstein’s General Theory of Relativity – which is a description of how gravity works. Also correct and valid. The barycentre concept sits within that one. Hi, Matt. There’s some interesting semantics involved in definitions, as you probably know. Essentially, the more you try to pin something down, the less you are able to do so. On the other hand, with new ideas that challenge the very limits of existing vocabulary (technical or otherwise), how do you cope? I’ve been watching the pictures of Pluto and Charon as they are released by NASA. I agree with you, it’s quite remarkable and wonderful! Can’t wait for the closest flyby on the 14th — what additional details will we see? Not long now before that question is answered and hopefully a few dozen new ones pop up! Growing up with Pluto being a planet made it hard to think of it as a moon when they changed it’s classification years ago. I’m glad it’s back to being a planet, but why ‘dwarf’? I never understood that either. I guess the alternative was ‘planetoid’, which is equally awful as a term.